King George III’s prodigious intellectual curiosity is reflected in his stunning collections of clocks and scientific instruments, his library, and his writing. When we convert this very analog King to digital form, what do we gain? In one of the most poignant examples of the King’s attention to the American crisis among the newly digitized materials in the Georgian Papers Programme, he begins with the exclamation “America is Lost!” A number of scholars, including in pieces now posted on the Programme’s websites, have considered the character and meaning of this essay. 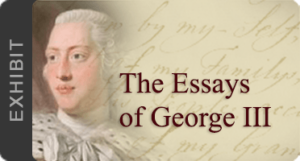 Like many of his contemporaries, and in the case of this essay, George III copied extracts of his reading, collecting and remixing them in a style familiar to many keepers of commonplace books. Still even if not all of the text originated with the King, the essay seems to reveal his thinking at a key moment in the last stages and the early aftermath of the American Revolution. 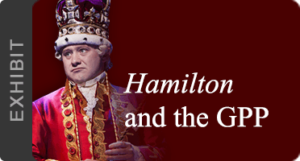 But what does it mean for readers now that we have access to this important piece of King George III’s writing in digital form? After all, “America is Lost!” is one of the manuscripts from the Royal Archives that’s been previously published. It has been available at least since 1994, when the Omohundro Institute’s journal, The William and Mary Quarterly, published with Her Majesty’s permission the essay as edited by historian John Bullion. (You can read Bullion’s essay about the king’s essay here.) Whereas it is now clear that the source for “America is Lost!” was Arthur Young’s Annals of Agriculture and Other Useful Arts (1785), Bullion emphasized the influence of the Earl of Shelbourne, who himself borrowed heavily from his agent in Paris, Benjamin Vaugh, in his ideas about the relative worth of the soon-to-be-former colonies. One obvious feature of ongoing digitization projects is the enhanced ability to identify, match and compare texts. Being able to look at the first edition of Young’s essay, for example, may suggest more about the timing of the King’s access to Young’s work and its relationship to his thoughts on the American situation. Looking at the King’s full corpus of writing along with the work of Young and other writers may also illuminate his correspondence networks in new ways. In one example of mapping these networks, Stanford University’s “Mapping the Republic of Letters” project allows for a variety of creative visualizations of intellectual correspondence among far flung Enlightenment writers. What will happen when we can specify and visualize the participation of King George III and Queen Charlotte in such networks? These are just a few of the avenues made possible through the Georgian Papers Programme. The analog King will have an important role to play in this digital age. I’ll bet he’d relish it.